Note that the above isn’t the actual command you’ll be using, as you’ll need to replace each instance of username with your actual username, and also determine your mount-point, which is not the device name (eg: /dev/sdb1). Note that if your custom label contains spaces (e.g. 1Tb Pocket Drive) , you will need to enclose the entire mount-point path in single quotes, but won’t need them if it’s a single word or multiple words joined by hyphens or underscores. That’s it – you should now be able to do whatever you want with the drive or partition in question, as you’re now the owner. If you’ve attached an external hard drive to your system, then decided to use your partitioner to format it to EXT4 for greater efficiency (or just to match your Ubuntu system), you may have been shocked to find that your empty drive seemed to be missing a few gigabytes when mounted afterwards. And this has nothing to do with the good old binary (base-8) vs decimal (base-10) situation which would see your “750Gb” drive be more like 700Gb (in Windows and earlier versions of Ubuntu – now Mac OS X and Ubuntu have followed hardware manufacturers and use decimal, so that’s more like 738Gb). This is because Ubuntu (and other Linux distributions) reserve typically around 5% of the space for the root user and system services, so should you run out of hard drive space, the administrator can still log in, and system services continue to run. However, this is only really needed for your Ubuntu partition, so if you have an external EXT4 drive, or have an EXT4 partition on your internal drive (other than the one your system is on), you are needlessly wasting space (40Gb of the drive in the example). But you can free up that disk space quite easily, without having to re-partition the drive or anything. All it takes is a couple of commands pasted into the terminal. That’s it – you now have all of your drive to use. … then the filesystem likely isn’t EXT4 – chances are the drive is actually formatted as NTFS or FAT for use on Windows systems (which would be the case if you’ve bought an external drive, and never did anything other than copy files to it). You would have needed to partition/format the drive to EXT4, so if you didn’t, then you actually don’t need this guide. Ubuntu is pretty awesome when it comes to automounting your drives and USB devices; in my experience, it is miles ahead of Windows, and it keeps getting better with each release. But for a greater level of control, you can’t beat the old-fashioned way: mounting your drives via fstab at boot. While Ubuntu now mounts drives and partitions in folders with names based on the labels, which includes spaces in the names, fstab is a tad more touchy when it comes to this. If you try mounting a drive in fstab to a mount-point with a path name like /media/Windows XP, the mounting will fail because of the space. Usual methods to get around this, like close the path off with / (ie: /media/Windows XP/) or put it in quotes (ie: ‘/media/Windows XP’ or “/media/Windows XP”), will fail – but there is a solution other than replacing spaces with hypens or underscores. The drive will mount in the appropriate folder from then onwards (ie: /media/Windows XP), and there’s no need to reboot if you’re urgently trying to access a drive – simply open a terminal and run sudo mount -a to mount all devices in fstab. Just in case you are unfamiliar with fstab, the way you edit it is sudo gedit /etc/fstab. However, if you needed that bit of info, chances are you really shouldn’t be doing so, unless you’ve first read a little of the abundant info available out there on the subject of fstab and mounting drives in Ubuntu (and other Linux distros). The last thing you would want to do is render your system unbootable because you made an error in editing fstab. While this guide is just for how to deal with spaces in paths, still exercise caution if this is all new to you. Please note that this is for the “legacy” version of GRUB still widely in use, not the next-generation GRUB 2. If unsure, check out this guide on how to find out which version of GRUB you are using. Close and save menu.lst and GRUB will automatically boot the last used OS from then onwards. Note that you will still be able to choose other OSes from the boot menu, and that whenever you boot to another, it will become the new default (until you boot another). Noting that the default entry (Ubuntu) is “0” not “1”, simply count the entries at the bottom of menu.lst, and deduct 1 from the value of the Windows drive/partition. In other words, if your GRUB menu has the four basic options (Ubuntu, Ubuntu Recovery Mode, Memtest+, and Windows), then your Windows drive is the fourth option, so the “default” value should be “3”. Obviously, if your boot menu has some earlier kernels still listed, and altogether there are 8 entries with Windows as the last, then the value would be “7“. As I said, simply count the entries at the bottom of menu.lst (they should all look similar to the Windows one) and deduct one from it (assuming Windows is the last entry, of course). Close and save menu.lst and GRUB will automatically boot Windows from then onwards. You can of course still choose another OS like Ubuntu at the boot menu before the countdown finishes. Please note that this is for the next-generation GRUB 2, not the “legacy” version of GRUB still widely in use. If unsure, check out this guide on how to find out which version of GRUB you are using. For the legacy GRUB version of this guide, click here. GRUB 2 has a different system for naming drives than you’re used to in Linux, and you will need to understand this before proceeding with commands or customisisation that requires this specific information. Both the drive and the partition are numbers in GRUB 2, with the drive starting from 0 (zero) and the partition starting with 1 (this is unlike legacy GRUB where both start with zero). This is different from the Linux convention of naming a drive a letter, and its partitions as numbers, starting with a and 1 respectively (eg: “a” in sda1 meaning first drive, with the “1” meaning the first partition on that drive). Also note that the drive and partition are separated with a , (comma) in the designations GRUB 2 uses. So therefore the first partition on the first hard drive (sda1 or hda1 in Linux) is hd0,1 in GRUB 2. Similarly, your second hard drive (sdb or hdb) would actually be hd1, and if you were talking about the 7th partition on your 3rd drive (sdc7 or hdc7) it would be hd2,7. For an introduction to drives, partitions and folders in Ubuntu, check out Differences Between Hard Drives & Media Storage Devices in Ubuntu & Windows. The most visual and informative way to get info about your drives and media storage devices, like the path names and filesystems, is to install GParted. That is the same partition editor on the Ubuntu Live CD, and you can install it with sudo apt-get install gparted in the terminal. It will end up in System > Administration, and will either be called Partition Editor, GParted or Gnome Partition Editor. To change devices, choose another from the dropdown menu in the top right. 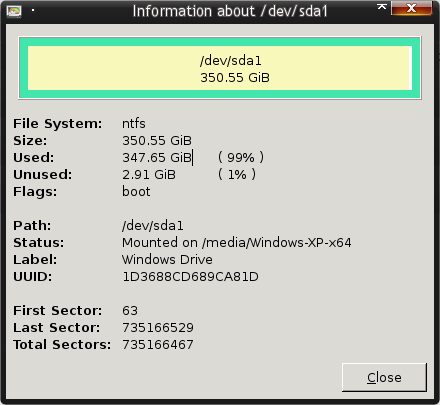 You can then right-click the partitions and choose Information to get more info. As you can see, there are many ways to get technical info about your devices and partitions in Ubuntu. If you’d like to see what files and folders are taking up the most space, check out Filelight for disk usage analysis.